The following antique age signs apply to table ware, etc. This does not mean other items, like vases should not have them. Hairlines and some cracks are natural phenomena. During firing the formed clay and the glaze are subjected to very high temperatures and some tensions in the material are created. During the cooling process clay and glaze are cooling down at different rates. This can cause hairlines in the glaze, and sometimes even cracks in the clay. Tight hairlines in the glaze are often only visible when viewed from an angle (like the one below). Spider cracks like the one shown on the right often form at the bottom, but occasionally do appear on other parts of ceramics. These are cracks with more than two end points that mostly do not go through to the rim. Hairlines or cracks may also appear after considerable amounts of time, due to environmental conditions like temperature change, etc. Basically, this type of crack is the result of a natural release of tension within the material. The same phenomena is occasionally encountered by porcelain restorers. When trying to piece shards together they find that two or more pieces do not fit completely anymore. This is because already present tension was released when the item was broken, and this release caused a minute change in the shard's breakage line in the process. Of course, many cracks are caused solely by external force. This can be because of knocking another ceramic item or any hard object. In such a case often a chip will be visible at the rim with a line running from it. 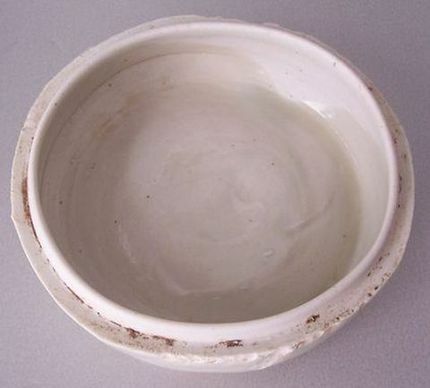 In ancient China high-quality porcelain was a precious item. Instead of discarding the shards when a piece was broken it was mended with metal staples. Today, antique porcelain mended in that manner on the back or underside is traded too. As long as it is not affecting overall appearance, an old repair with staples is seen as proof of its age. If only a series of holes remain it is probably due to a modern restoration which removed the staples. Firing faults are defects that develop naturally while an item is fired in the kiln. See Firing Faults. Warping did mainly affect dishes, plates and bowls and is frequently seen in simpler porcelain items of the Ming dynasty. See warping of antique dishes. The age of this porcelain box is quite easy to recognize. However, please be careful, with some ceramics it is necessary to check closely whether these age signs are forged. 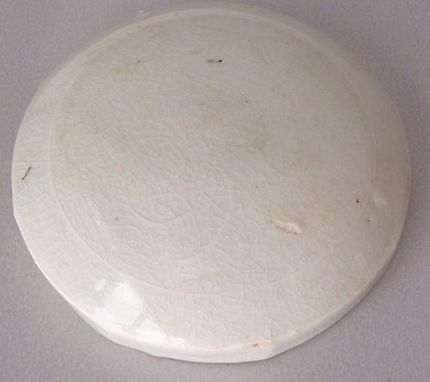 Lid and cover of an antique porcelain box (white).